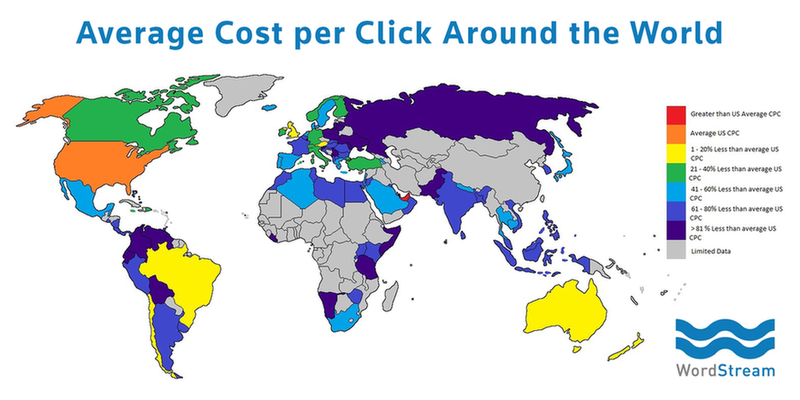 Average Cost per Click by Country: Where in the World Are the Highest CPCs? Location, location, location! In search, we know that users search for different things in different states and that the average cost per click advertisers pay differs by state too. Below are the 97 countries represented in the map, in order of highest average cost per click to lowest average cost per click, compared to the US average CPC, which is between $1 and $2 on the Search network. The United Arab Emirates has an average CPC 8 percent greater than the US average. Austria has an average CPC 2 percent less than the US average. Australia has an average CPC 5 percent less than the US average. Brazil has an average CPC 11 percent less than the US average. The United Kingdom has an average CPC 13 percent less than the US average. New Zealand has an average CPC 14 percent less than the US average. Chile has an average CPC 16 percent less than the US average. Switzerland has an average CPC 21 percent less than the US average. Italy has an average CPC 25 percent less than the US average. Canada has an average CPC 29 percent less than the US average. Germany has an average CPC 31 percent less than the US average. Turkey has an average CPC 32 percent less than the US average. Finland has an average CPC 33 percent less than the US average. Jamaica has an average CPC 33 percent less than the US average. Norway has an average CPC 34 percent less than the US average. The Dominican Republic has an average CPC 40 percent less than the US average. Ireland has an average CPC 40 percent less than the US average. Iceland has an average CPC 44 percent less than the US average. Portugal has an average CPC 44 percent less than the US average. Greece has an average CPC 46 percent less than the US average. Lebanon has an average CPC 47 percent less than the US average. Japan has an average CPC 47 percent less than the US average. Sweden has an average CPC 49 percent less than the US average. Spain has an average CPC 50 percent less than the US average. Mexico has an average CPC 50 percent less than the US average. Cambodia has an average CPC 51 percent less than the US average. Armenia has an average CPC 52 percent less than the US average. South Africa has an average CPC 55 percent less than the US average. Israel has an average CPC 55 percent less than the US average. Netherlands has an average CPC 56 percent less than the US average. Algeria has an average CPC 56 percent less than the US average. Nepal has an average CPC 57 percent less than the US average. Denmark has an average CPC 57 percent less than the US average. Belize has an average CPC 57 percent less than the US average. Singapore has an average CPC 58 percent less than the US average. Thailand has an average CPC 58 percent less than the US average. Saudi Arabia has an average CPC 60 percent less than the US average. Macedonia (FYROM) has an average CPC 61 percent less than the US average. Trinidad and Tobago has an average CPC 61 percent less than the US average. Nicaragua has an average CPC 61 percent less than the US average. Oman has an average CPC 61 percent less than the US average. Indonesia has an average CPC 62 percent less than the US average. Rwanda has an average CPC 62 percent less than the US average. Croatia has an average CPC 63 percent less than the US average. France has an average CPC 64 percent less than the US average. Libya has an average CPC 64 percent less than the US average. Kuwait has an average CPC 64 percent less than the US average. Egypt has an average CPC 65 percent less than the US average. Belgium has an average CPC 69 percent less than the US average. Romania has an average CPC 69 percent less than the US average. Panama has an average CPC 69 percent less than the US average. Uganda has an average CPC 69 percent less than the US average. Bulgaria has an average CPC 71 percent less than the US average. Peru has an average CPC 71 percent less than the US average. Albania has an average CPC 72 percent less than the US average. South Korea has an average CPC 72 percent less than the US average. El Salvador has an average CPC 73 percent less than the US average. Zimbabwe has an average CPC 73 percent less than the US average. Jordan has an average CPC 73 percent less than the US average. Costa Rica has an average CPC 73 percent less than the US average. Uruguay has an average CPC 74 percent less than the US average. Tunisia has an average CPC 74 percent less than the US average. Kenya has an average CPC 74 percent less than the US average. Malaysia has an average CPC 75 percent less than the US average. Philippines has an average CPC 75 percent less than the US average. Vietnam has an average CPC 76 percent less than the US average. Sri Lanka has an average CPC 77 percent less than the US average. The Bahamas has an average CPC 77 percent less than the US average. India has an average CPC 77 percent less than the US average. Argentina has an average CPC 78 percent less than the US average. Hungary has an average CPC 78 percent less than the US average. Morocco has an average CPC 78 percent less than the US average. Bangladesh has an average CPC 79 percent less than the US average. Slovakia has an average CPC 80 percent less than the US average. Mauritius has an average CPC 81 percent less than the US average. Qatar has an average CPC 81 percent less than the US average. Bolivia has an average CPC 81 percent less than the US average. Poland has an average CPC 81 percent less than the US average. Luxembourg has an average CPC 82 percent less than the US average. Ecuador has an average CPC 82 percent less than the US average. Colombia has an average CPC 83 percent less than the US average. Russia has an average CPC 84 percent less than the US average. Namibia has an average CPC 84 percent less than the US average. Pakistan has an average CPC 84 percent less than the US average. Guyana has an average CPC 85 percent less than the US average. Montenegro has an average CPC 86 percent less than the US average. Lithuania has an average CPC 86 percent less than the US average. Tanzania has an average CPC 88 percent less than the US average. Venezuela has an average CPC 88 percent less than the US average. Bahrain has an average CPC 90 percent less than the US average. Latvia has an average CPC 90 percent less than the US average. Slovenia has an average CPC 92 percent less than the US average. Somalia has an average CPC 92 percent less than the US average. Ukraine has an average CPC 92 percent less than the US average. Liberia has an average CPC 92 percent less than the US average. Moldova has an average CPC 92 percent less than the US average. Serbia has an average CPC 95 percent less than the US average. Use these free tools to quickly see if your cost per click (CPC) is higher or lower than average in your industry. Just select your currency and network for an instant result. Need more help with your online ads? Check out our (free!) all-star playbook to online advertising. 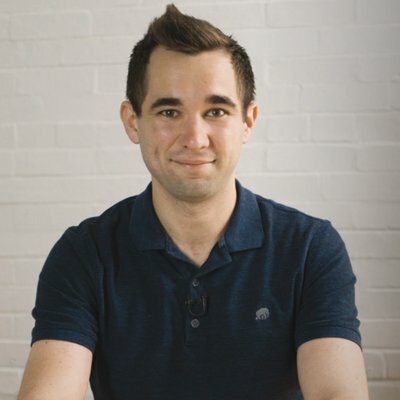 To determine the relative CPC for each country, I used our free keyword tool to create a list of over 15,000 high-volume English search keywords across over 20 different industries. I then took this list and ran it to the Google Keyword Planner to get average CPC estimates for these keywords in each country to see how Google estimated their costs per click would differ across the globe. With this list of estimated CPCs by country, I then indexed it and compared each country’s estimated CPC against the estimated CPC of the US to complete this analysis. Having this data be as unbiased as possible was a priority for me. The decision to use estimates from the Google Keyword Planner data protects this research from any biases from individual clients who target different states or use geo bid modifiers. The volume of keywords considered across different industries protects this analysis from a bias of a rogue keyword or industry with spiked regional interest. There are some interesting trends in this regional CPC data on Google. The nation with the highest CPCs (and the only country to have a higher CPC than the United States) is the United Arab Emirates, where CPCs average 8% more than they do within the US. A rich and diverse economy – which relies on industries such as finance and tourism, known for their high CPCs – likely helps to put the country at the top of the list. Excluding the UAE and the US, the next ten most expensive countries (Austria, Australia, Brazil, the United Kingdom, New Zealand, Chile, Switzerland, Italy, Canada, and Germany) all either share strong economic ties to the US, have surging economies, have very high English-speaking populations, or some combination of several of these. Also, in all of these countries, Google acts nearly as a monopoly of search, with no significant competition from other search engines. Eastern Europe and Russia have a surprising number of spots at the bottom of the list, with incredibly cheap CPCs. We know that some of this is due to a struggling Russian economy helping to cut CPCs for foreign advertisers. It’s also likely due to the presence of Yandex, a competitor search engine to Google, which has an overwhelming majority share of the market in that corner of the world. In similar markets, where Google doesn’t have a majority share of search, like Japan and South Korea (where Yahoo Japan and Naver are the locals’ search engines of choice), we also see discounted CPCs from Google (much as here, in the US, Bing has cheaper CPCs). South and Central America, Africa, and much of the Middle East have CPCs far below the US average. While this is likely for a number of economic reasons and limited internet penetration in these regions, a growing factor is the rising number of users who are accessing the internet and Google on their smartphones. Internationally, mobile CPCs are generally cheaper than desktop CPCs, so a successful mobile strategy is an increasingly critical role in converting these international users. Do you see any other interesting trends in the data? Are you seeing similar trends in your accounts or in your industry?